The 2017 Alumni Team, back row, from left, Jonny Peckham ‘86, Mackenzie Hester ‘11, Vanessa Rothe ‘88 , Sage Patchell ‘16, Cammie DeGeus ‘98, Sarah Salem’02, Marguerita Trevino ’84 and Kathy McKeown ’83; front, Alexandra Palmer ‘09, Avery Bush ‘12, Jamie Swintek ‘98 , Chanel Stewart ‘10, Stewart and Alison Palmer ‘12. The girls volleyball team prepped for another CIF run with their annual alumni match last Friday, Oct. 6, at Dugger Gym. The Breaker varsity held on to defeat their elders two sets to one. 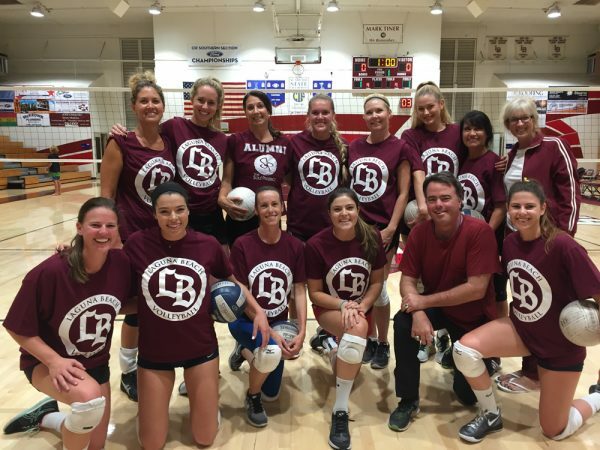 This year’s alumni included a number of top Division 1 players, three of whom were first team all-Orange County selections as players at Laguna Beach High School. Former coach Lance Stewart (89-90, 2003-12) served as the alumni coach while former coach Bill Christiansen (86-87, 95) was the referee.